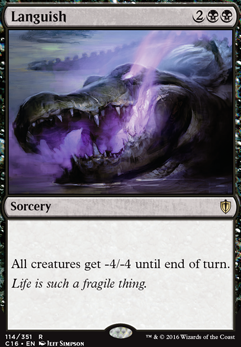 Will Post-death counters save a creature from languish? Some good budget options for Skullbriar are conditional board wipes, like Languish and Mutilate , since Skullbriar can easily get big enough to survive them. Retribution of the Ancients is another good repeatable removal option. 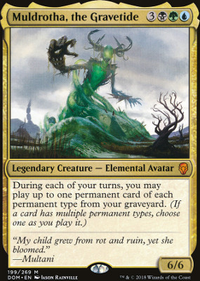 Unspeakable Symbol is great at using your life as a resource to make Skullbriar bigger. If you can't afford surgical, Ravenous Trap does a good impression. There is also an alternative for budget mill- dont' play like a burn deck, play like midrange/control. Mind Grind , Mind Funeral and Grindclock s are enough to win a game on their own, if they are paired with a decent control package. 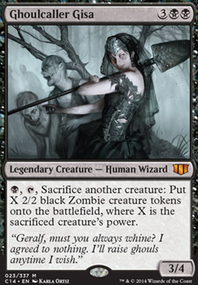 Cards like Languish , Mana Leak , Dimir Charm , Memory Plunder etc then try to buy yourself as much time as possible. You will want to plan out your sideboard carefully- 'side 15' works wonders with this, swapping low impact cards for marginally more useful (languish for negates for example) does a lot. If you are also digging for the combo kill, some Despise or Duress should carry the rest through. There are also marginal 'pillow fort' options that are low price because they have to compete with Ensnaring Bridge - Storage Matrix in particular can work well. 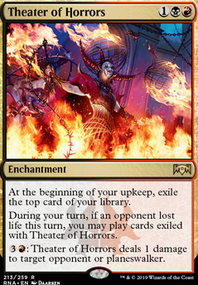 Haunting Echoes is an interesting option for mill, often killing combo-reliant decks dead. If that isn't your jam Shriekhorn will help speed things up. I would consider a few of the stronger mill payloads, such as Mind Grind , Fraying Sanity , and Sphinx's Tutelage . A fun combo is Duskmantle Guildmage and Mindcrank for infinite mill and damage. You are also fairly low on removal, and a slow mill deck wants a lot of that. There are the more expensive options like Damnation or Cyclonic Rift , but you seem like you want to stick to a low budget so I would recommend AEtherize or Languish . Phenax, God of Deception is very popular as a mill commander, but is still good in the 99 if you want to stick with Mirko. Counterspells are also very powerful in a deck like this, since you don't care about you're opponents board state much, and Counterspell , Commit / Memory , Foil , Spell Swindle , and Memory Lapse are very good for that role and are pretty cheap to pick up. 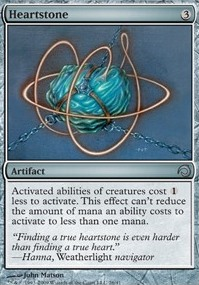 Grindstone is pretty expensive, but can kill a mono-color deck very quickly if your play group has a lot of that. For my mill i’m creatureless except for Hedron Crab and everything is fine. What i’ve been doing is just running Damnation , Echoing Truth , and Crypt Incursion to last the distance. 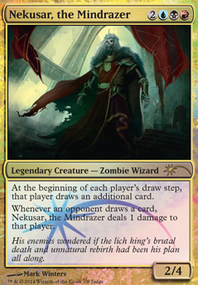 Trying to do this on a budget is a bit trickey, because Damnation is the most easy free win card vs creature decks. I’d imagine Languish will do the job 80% of the time. For me i’m running 4x Damnation, 3x Truths, 2x Incursions. You’ll probably want something similar but with Languish instead of dammy to save some $$$. Include a playset of Visions of Beyond if you can so you can dig for them easier. If you were to go with mill, you'd want to go UB, especially if you go up against aggro often. You might not be able to afford some of the better mill cards though, like Glimpse the Unthinkable , Archive Trap , Mesmeric Orb (if you were to spend some extra $ get those Glimpses first). Crypt Incursion , Profane Memento , Darkness , Gigadrowse , and various B removal spells ( Languish , Cry of the Carnarium , Fatal Push ) would help out your aggro matchup a lot. Hedron Crab and Manic Scribe can block if need be. Languish for sure. Mainboard sweepers really tank your win percentage against control and tron and those matchups will be tough to begin with. 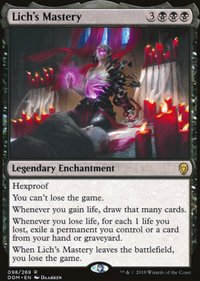 Of course by removing Languish your Spirits and Humans matchups get worse, but I don't think you'll win a game vs Tron if you draw Languish, whereas you can win vs Sprits and Humans on a good draw. I also recently came to the conclusion that Tombstalker might be really good tech for Grixis right now. It's amazing vs Spirits and Humans because it can block flying creatures. It also blocks Arclight Phoenix . I'm worried about over-use of your graveyard. 3 Gurmag and 1 Tasigur and a Logic Knot is a lot of dedicated delve. 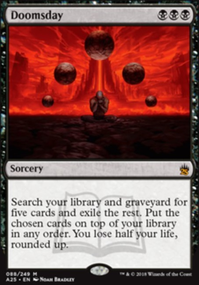 And without fetch lands you will struggle hard to get a big graveyard. The most expendable of these is Logic Knot . Shyvana_ on Dad, you killed the zombie Flanders! Yeah, I noticed that this morning after I posted, sorry about that. There are not many good and cheap black boardwipes, granted, not many great cheap black boardwipes period. Languish is bulk but doesn't kill the big stuff. Then there are a lot of really expensive (Mana wise) boardwipes that usually only hit the opponents and stuff. But you know, take it as you want, it's your deck FlyingFreak26!